I got a few bits for my birthday, as well as popping into the Glasgow store a few weeks ago! For my birthday I was actually given Intergalactic and Twilight in a set which was super exciting! I have had both before so I knew I would love them both. Intergalactic smells a lot like spearmint and the colours that are left in the bath are incredible! It leaves your skin feeling very soft and moisturised due to the Cedarwood Oil. I would 100% buy it again. The day of my birthday I used Twilight, the scent is very sweet and reminds me of candyfloss. It gives the bath a pretty glittery pink colour and again makes your skin so soft. It contains Lavender so popping this in the bath is also extremely calming and relaxing. 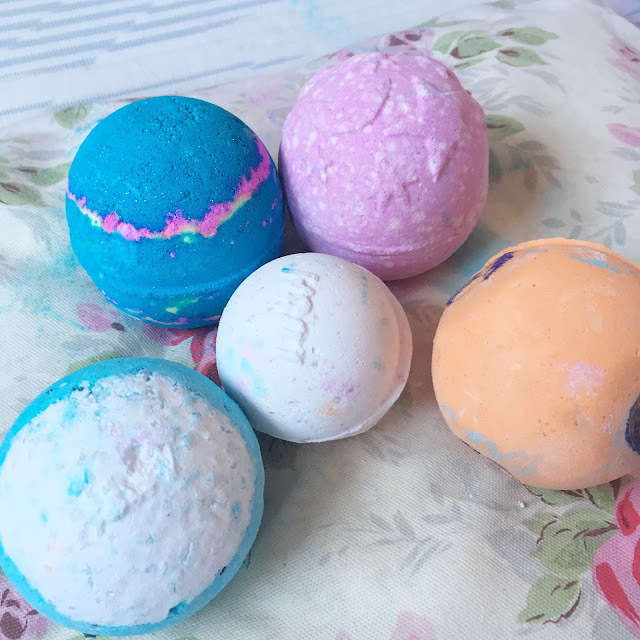 I actually repurchased this bath bomb when I bought the rest as it is one of my favourites. I then picked up Big Blue, I actually picked this up as it a very pretty colour. After speaking to the Lush worker, she explained one of the ingredients was Arame Seaweed. Apparently, it is meant to be very good to regulate the metabolism, so it went straight into my basket. It is also is meant to be good for your skin so it is a win-win. The smell is nice and fresh and I can't wait to use it . ButterBall is the product I am most excited about, I wish I could remember the girl's name that helped me but again she explained that this is great for dry or irritated skin. I have spots on my arm so hopefully, this will help. It also contains Ylang Ylang which helps with stress and anxiety so it would be interesting to try. Last bath bomb I bought was Lava Lamp, the product looks super eye-catching and I can just tell it will give the best colours in the bath. The scent isn't a scent I would reach for in Lush, as I am more of a sweet gal, however, I love this. The Tangerine Oil gives it the best fresh citrus scent, it is described as fruit pastilles on their website and I totally agree. It contains Cocoa Butter which is my favourite moisturising ingredient so I am VERY excited to give this a go. After trying this bath bomb in the bath, it was super moisturising and smelt amazing! However, When I got out the bath my whole skin was patchy purple! I tried to wash it in the shower, just with water but it never worked!! I had to exfoliate my skin for at least 10 minutes until it all came off! However, Lush were amazing about the whole situation and sent me a free bath bomb for my troubles! Have you been into Lush lately, what have you been loving?? Let me know if there is any products I need in my life. Has anyone had the same problem!? Butterball is my absolute favourite lush bath bomb. Its the only one I buy nowadays, so so stress relieving and moisturising. Sorry to hear about your purple skin incident, at least you have a kinda comical story for your blog now though haha! 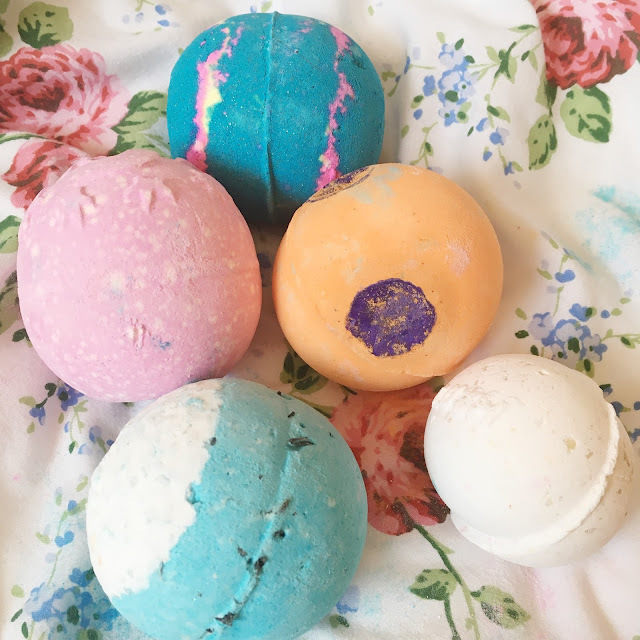 Thanks for sharing, love a LUSH haul! Your photos here are beautiful! I have the driest skin, so I'll be giving ButterBall a shot next time I'm in Lush! These all sound amazing, but such a shame that the purple one dyed your skin. Very annoying. Great haul, I was going to buy Lava Lamp but maybe not! !